Today marks the fourth year since the Islamic terrorist attack on the US that murdered more than 3,000 people and destroyed the World Trade Center, heavily damaged the Pentagon, and woke people up to the real danger of Islamic terrorism. Well, that last part is still wishful thinking as people still don't quite realize the threats this country faces. As I write this, the names of the WTC victims are being recited at Ground Zero in Lower Manhattan. What is thus far the enduring memorial? The Times discusses the ad hoc memorials that sprang up around the city in the days and weeks following the attacks. However, the article itself doesn't mention who did the attacks. There is a passing reference to terrorism, but how are people supposed to remember the day if they don't remember who did this to us? It would be like remembering Pearl Harbor day on December 7 and not saying that it was Japanese fighters that launched the attack, which brought the US into World War II. So, for the record, let me restate this day. 9/11/2001 was the day that 19 Islamic terrorists hijacked four airliners with the intent to kill tens of thousands of Americans while they were at work, play, travel, and engaging in life, crashed those planes into the Pentagon and World Trade Center's Twin Towers, and murdered more than 3,000 people. Al Qaeda, an Islamic terrorist group with ties to Saudi Arabia, Afghanistan and a host of other failed states, claimed responsibility. An empty void remains in Lower Manhattan. Thus far, that is the memorial and reminder of what happened. The towers have not been rebuilt and the plan calls for a single skyscraper to replace the Twin Towers surrounded by a gaggle of lower buildings. There is criticism at every corner of the plan - from the inclusion of anti-American groups in the cultural center, to the placement and design of the Freedom Tower. The NYT has a poll saying that now is the time to rebuild and that New Yorkers want action. Excuse me, but they've wanted action for quite some time now. They haven't liked the direction things have gone with the rebuilding and the Times has been perfectly content in letting the rebuilding lag. Four years after the Sept. 11 terrorist attack, two-thirds of the city's residents are worried about another attack and almost as many are concerned that the city is not prepared for such an event. Still, 61 percent said that there had been enough talk about what should be done at ground zero and that the time had come to start development. Almost 90 percent of New Yorkers want a permanent memorial to the victims of the terrorist attack at ground zero, but 57 percent also support the construction of office and residential buildings there. Those who said they wanted only a 9/11 memorial weighed in at 29 percent; and 8 percent said it should stay just as it is now: an open hole in the ground surrounded by temporary memorials - at least for the time being. The views of those who said they lost someone close to them on 9/11 are little different from the opinions of all city residents on what should be done with the trade center site. "I lost several co-workers and friends down there, but I cannot look at the entire ground zero as a memorial," said Perry Catella, a retired emergency medical worker for the Fire Department, in an interview after the survey. "There should be a portion set aside to be a memorial, but the vast majority of that area has to be put to use to help the economy of New York City." Steve Cuozzo is keeping score on the development of Lower Manhattan and the tally isn't pretty. Bloomberg is indifferent, Pataki looks bumbling, and everyone is dragging their heels since Pataki's not running for reelection and no one knows who the next Governor will be. It is the governor who exerts the most influence over the downtown reconstruction through both the Port Authority and LMDC. Yet, no one knows what any of the potential candidates think should be done downtown. Polipundit has more. The image has been bumped to the top. An excellent timeline of events on 9/11, followed by the US response in the days and weeks thereafter. And never forget the jumpers. These people were forced to decide how to die - jump to their deaths or die from suffocation and fire. 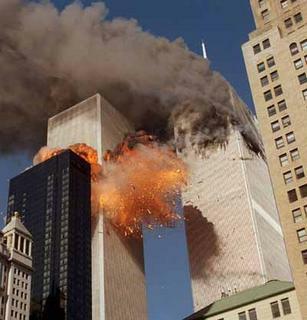 More than 200 people appear to have jumped from the Twin Towers before they collapsed. Michelle Malkin; Stop the ACLU; The Jawa Report; Outside the Beltway; Castle Argghh; Ace of Spades; Mudville Gazette; California Yankee; Winds of Change; Iowa Voice; Bright and Early; Wizbang! ; Pirate's Cove; Captain's Quarters; Blackfive; Daily Pundit; and many many many others. How could I miss Instapundit? Camera Planet has assembled literally hundreds of hours of video related to 9/11 for archival purposes.